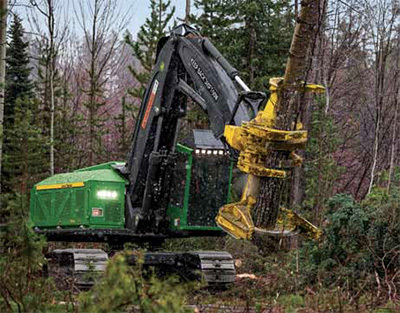 B.C.’s R. Clauson Logging recently embarked on a new logging venture, moving into the Prince George region, and it has the support of two new 953M series feller bunchers—and dealer Brandt Tractor and manufacturer John Deere behind them all the way. Embarking on a new venture is easier with proven partners in support. R.Clauson Logging Ltd., has two major partners in its corner. The first is Clauson Logging’s people, the ones who make the company work day in and day out. The second set of partners are John Deere and Deere dealer Brandt Tractor which provide the reliable equipment and the essential back-up service respectively so the logging company can do its work and consistently meet its obligations. The 330 hp 953M has the tried and true John Deere features like its renowned track power—but experienced loggers like R. Clauson Logging have also had their say about the new machine's features. Those partnerships were instrumental, albeit in different ways, influencing Clauson Logging’s decision to expand its business north from Quesnel into the Prince George region of British Columbia early in 2015. The continuing commitment to John Deere forestry machines is reflected in Clauson’s acquisition of two new 953M-series tracked feller bunchers for its new harvesting side. The machines can better handle the Prince George region’s larger piece size averages compared to those encountered around Clauson’s Quesnel home base. The logging contractor continues its long standing harvesting relationship with Tolko Industries in the Quesnel area. Taking delivery of its first 953M feller buncher was like being re-acquainted with an old friend. The 330 hp 953M has the tried and true John Deere features like its renowned track power—but experienced loggers like Clauson have also had their say about the new machine’s features. Clauson Logging was one of the customer advocacy groups sought out by John Deere’s team of engineers to gather input into the design of the M series of machines. A single joystick push has helped simplify boom and stick operation on the 953M, says Clauson. The Rapid Cycle System is optional and there’s an automatic head leveling system that can be engaged if required. “The machine has a longer boom reach (in excess of 29 feet) and a wider cutting swathe which can help improve production through less machine walking,” he points out. “With bunchers, it’s the little things,” Clauson added. Like re-locating the toolbox to the machine’s track frame. Apart from being handy, it helps free up space in the operator’s cab which has undergone extensive redevelopment in the M series of machines. Good machine operators with local knowledge can be especially important when moving into a new area, as is the case with Clauson's Prince George division. Operator comfort, safety and ability to do the job required are the priorities on the 953M. The operator’s visibility is enhanced compared to earlier models, with up to 44 per cent more glass, including an overhead skylight. The operator has a fully adjustable suspension seat. In-cab storage space has also been improved. Tilt hoses have been rerouted in the 953M in what is a beefier machine all around. The John Deere-manufactured FR24B cutting head has the ability to accumulate a couple of trees at a time for improved productivity. And it handles well within itself the taller and greener wood now being more frequently encountered in the Prince George region. “You don’t want to be pushing a machine to the max all the time,” says Clauson. The 953M features a sealed switch module which is a pass code for use of the machine by up to 10 operators. It allows each operator to instantly engage his personal pre-set operational parameters. It includes things like track power and button configuration. 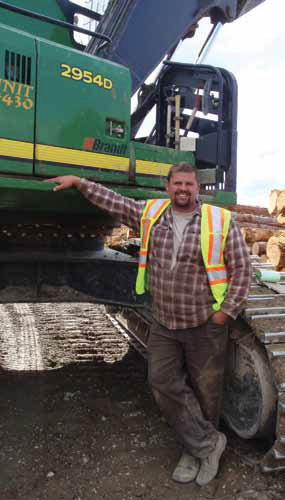 Derek Landry is the regular 953M operator for Clauson Logging. “We really haven’t had to do much with the machine apart from tweaking a couple of pressures early on,” says Landry. Since then, about 450 hours of operation have been put on the machine’s clock. “The 953M is a lot more stable,” reports Landry. That’s because the machine’s tracks have been widened by four inches and the track frame enlarged by nine rollers. “The cab is roomier, you can see better—there’s really good visibility—and you feel safe in the cab,” adds Landry. He also notes the 953M runs cool even when the ambient outdoor temperatures are around 30 degrees. Clauson Logging’s new side is for Canfor’s Polar Division sawmill complex at Bear Lake, about 72 kilometres north of Prince George. The contractor’s relationship with Canfor in the region began last spring with an assignment to harvest about 40,000 cubic metres of mainly small diameter wood. “Since then we’ve had meetings with Canfor and we’ve been very happy with them. We’re now working on a 350,000 cubic metre contract for five years and we’re continuing to talk and hope to grow that in the future,” says Clauson. "John Deere is really pro-active seeking people out. And they listen to you," says Dustin Clauson (left), who is running the company's new Prince George side, which uses the new 953M bunchers. The family-owned log contracting company with principal Rick Clauson (Dustin’s dad) has been a fixture in Quesnel for 43 years. The bulk of that time has been as a primary Tolko contractor, with volumes augmented by occasional BC Timber Sale blocks. But the dynamics of the forest industry there have changed in the aftermath of the mountain pine beetle epidemic. Forest companies and their contractors are anticipating cuts in harvesting volumes in the Quesnel Timber Supply Area as a result. Clauson Logging helps put the food on the table for at least 80 people between the two divisions, including company-owned and contract truckers. There are about 20 people working on the Prince George side. The good equipment part of the equation is where John Deere and its dealer Brandt Tractor Ltd., come to the forefront. Clauson’s Prince George side runs a Deere 903K apart from the two new 953M-series feller bunchers. The machines are complemented by Deere 2954 and 2454 log loaders; two 848 skidders; a 1910 forwarder; three Deere 2454s with Waratah 623 processing heads, and a Deere 2154 with a 622 head. There’s also a small Deere 160 hoe for graveling and ditching and two Caterpillar dozers for roadbuilding. No indeed. To Clauson Logging, John Deere’s green and yellow paint job looks just fine.